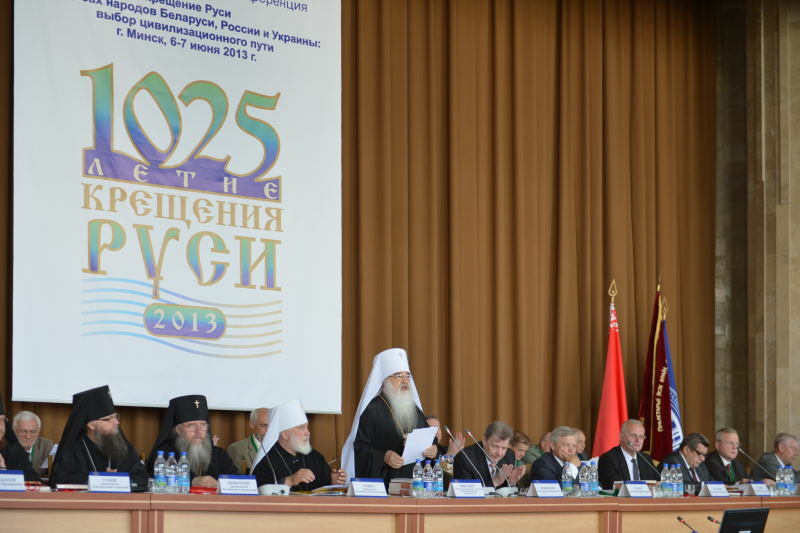 An International Reflection-Action Conference on ‘The Baptism of Russia in the Destinies of Belarus, Russia and Ukraine: The Choice of a Civilizational Path’ took place on June 6-7, 2013, at the Belarus National Academy of Sciences. It was held at the initiative and with the blessing of His Holiness Patriarch Kirill of Moscow and All Russia. The principal aim of the two-day forum, which has launched a series of events to celebrate the 1025th anniversary of the Baptism of Russia, was an attempt to reflect on the significance of that event in the historical life of the fraternal nations of Russia, Ukraine and Belarus and its decisive impact on their religious and cultural development. Special attention was given to the positive changes which have taken place in the life of the Russian Orthodox Church since 1988 which marked the Millennium of the Baptism of Russia. The conference was attended by Russian Orthodox bishops and priests, Russian, Ukrainian and Byelorussian scholars and public figures as well as representatives of the scientific communities in Poland and Germany. After the grand opening on June 6, Metropolitan Pavel of Ryazan and Mikhailovsk read out a message of greetings from His Holiness Patriarch Kirill. A message of greetings also came from His Beatitude Metropolitan Vladimir of Kiev and All Ukraine. There were also messages from Belarus President Alexander Lukashenko and the vice-chairman of the Byelorussian National Academy of Science, V. Gusakov. In his address to the organizers and participants in the forum, Metropolitan Filaret of Minsk and Slutsk, Patriarchal Exarch for All Belarus, emphasized that ‘the Baptism of Russia was a fateful event not only for our Church but it also predetermined the civilizational vector of the development of the peoples in historical Rus’ who make up today the space of Belarus, Russia and Ukraine’. Among the speakers at the conference were, along with prominent hierarchs and church scholars, representatives of governmental bodies and the secular scientific community.